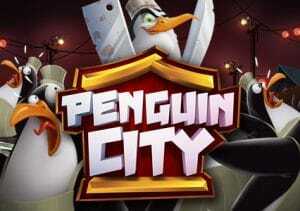 Take a trip to Penguin City, a strange but superbly well designed 5 reel, win all ways video slot from Yggdrasil Gaming. The game comes with a Penguin Escape Mode feature which can award sticky wilds and re-spins. Look out for the wild Emperor Penguin who guarantees a win whenever he lands then drops down 1 position on the following few spins. Play this low to medium variance title from between 10p and £125 per spin on all devices. Yggdrasil Gaming video slots are usually very easy on the eye and the Scandi developer has really excelled itself with Penguin City which looks superb. The kitchen of the wicked Emperor Penguin’s restaurant is the setting. Joining the lower value playing card suit symbols are knife and chopping block, a bowl of Chinese broth, a fish pot, a bottle of soy sauce and a carton of noodles. There’s also a wild – when these land, they stay locked in place for the spin that follows. Winning combinations are created by landing 3 or more matching symbols either vertically or horizontally. The best winning opportunities arise in the Penguin Escape Mode feature which is triggered by landing a winning spin that includes a wild on reels 2 or 4. You’ll then get a re-spin with the wild staying in position. You’ll then see animated penguins (who are trying to escape Emperor Penguin) make a jump for freedom. If they land on the reels, you can look forward to one of 2 special extras. Either a sticky wild will be added to reels 2 or 4 or a there’ll be a symbol swap on reel 3 which turns a losing spin into a winner. Re-spins play out until there’s a losing spin. The 3-symbol high Emperor Penguin can hit on reel 3 during the Penguin Escape Mode feature. He is a wild. When he appears, you’re guaranteed to land a winner. The Emperor drops down 1 position on each spin until he falls off the bottom of the reels. Yggdrasil Gaming titles usually combine high class design and interesting extras and that’s just what you can expect in Penguin City. It’s not a particularly volatile game (the variance is in the low to medium range) and the lack of free spins will put some people off. It shouldn’t though as re-spins and extra wilds in the Penguin Escape Mode feature deliver plenty of action – to the tune of 1,647 times your bet on every spin. The theme is slightly bonkers but the blend of classy design and regularly hitting re-spins make a visit to Penguin City well worth making. If you like Yggdrasil Gaming, Vikings Go To Hell is a must.